Traditional St Clements – a zesty, sparkling treat from our friends at Luscombe. Sweet orange juice from organic groves in the volcanic soil of Mount Etna is combined with sharp Sicilian lemon juice and finished off with just a touch of fizz. Serve chilled over ice; it loves seafood (particularly smoked salmon), scrambled eggs and omelettes. Store in a cool place. Chill and tip twice to lift sediment and mix citrus oils before serving. Once opened, refrigerate and drink within 5 days. 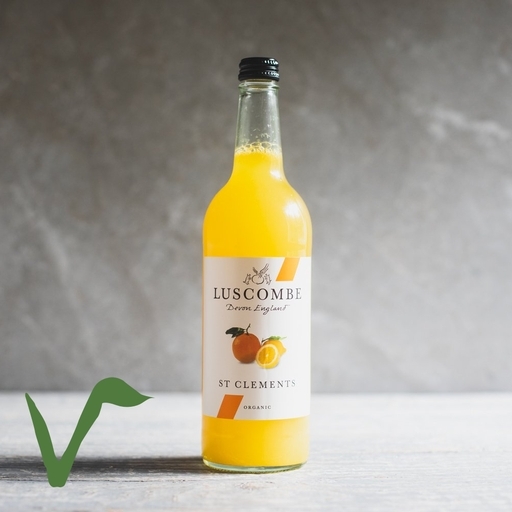 Luscombe have been making juices in small hand-made batches since 1975 within the historic setting of the Domesday Farm at Buckfastleigh in South Devon. Luscombe drinks are made using only the finest quality fresh ingredients.